I have always interested in getting a Nomadic wise-walker bag. Jetpens sells some online, but from the description it didn't seems to fit my needs. Luckily I am in Hong Kong and found the right bag for myself. 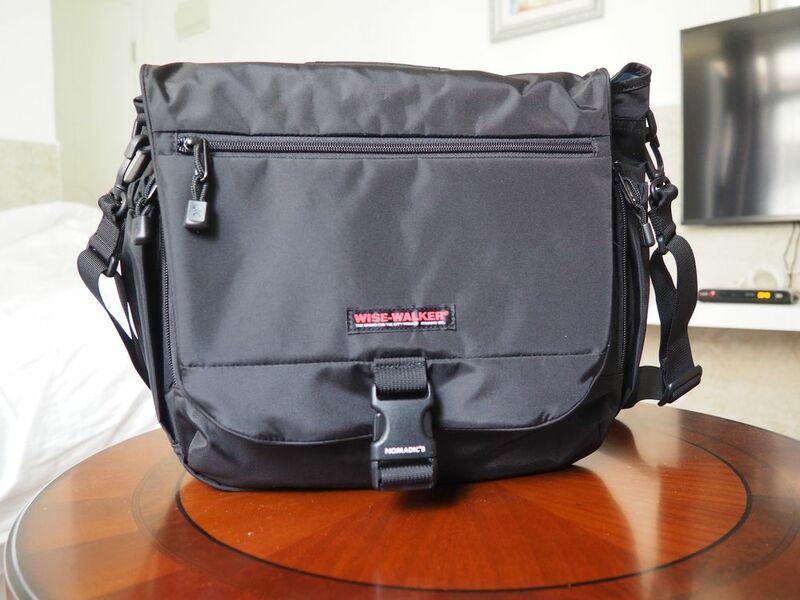 Here is a review of the wise-walker OS01 bag. Why is this bag so good? It looks small on the outside, but the carrying capacity is great. It is comfortable to carry, and it is secure. 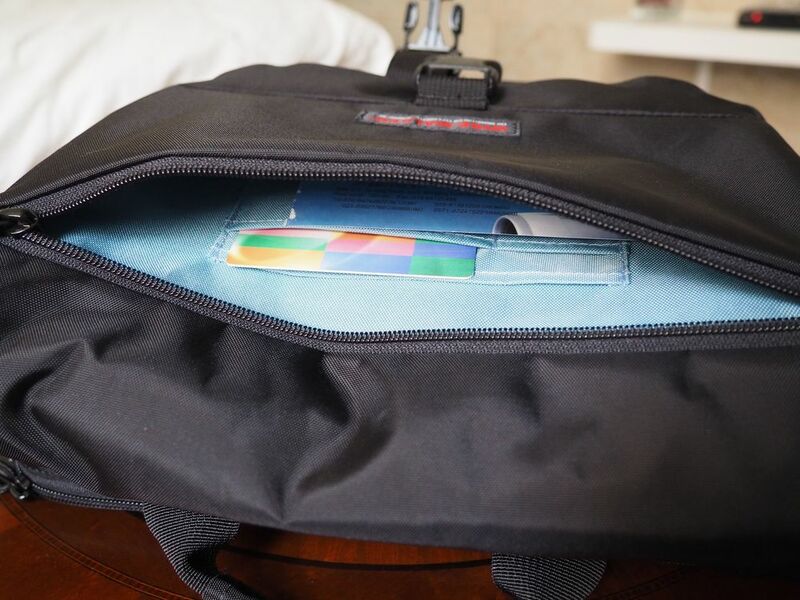 The bag has a large rectangular main compartment, and a ton (well maybe 14) of organizing pockets and areas. When travelling or commuting, a lot of the items I crarry are small. 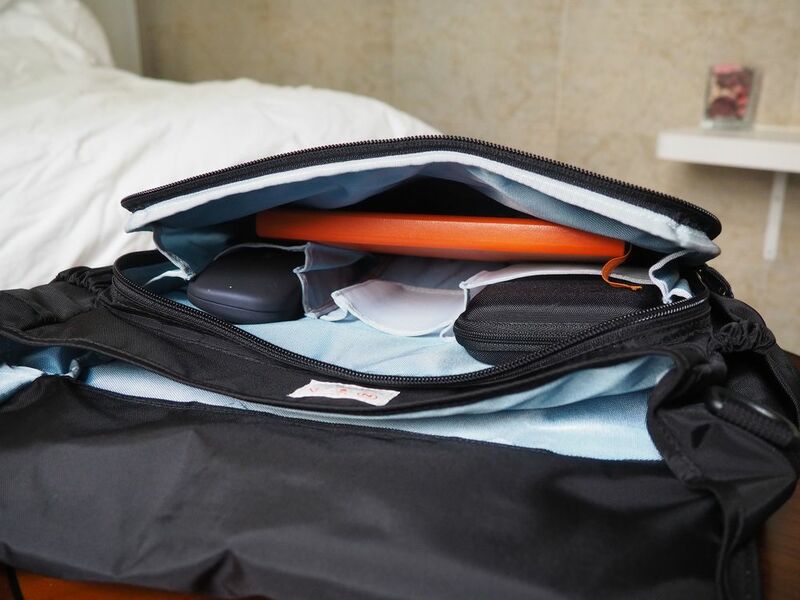 They will all fit outside of the main pocket, leaving the main compartment for the larger items like laptop or camera and a sweater. The bag is comfortable to carry. I like to carry these bags messanger bag style, with the bag resting on my lower bag. 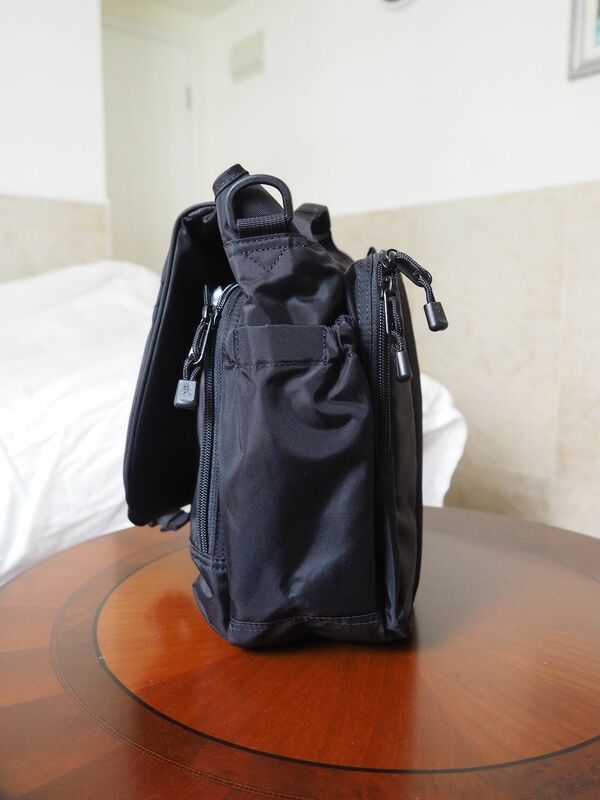 This bag has the air meshed in the back to reduce sweatiness, important when in Asia. The shoulder strap has a padded pad in the middle. The bag is designed to keep its content secure. This is especially important in some cities like Hong Kong. I can keep wallet and ID cards etc in areas of the bag that is very difficult to be pick pocketed. The shoulder strap pad is sewn on as part of the strap. It is not movable. As a result it will not slide back and forth. 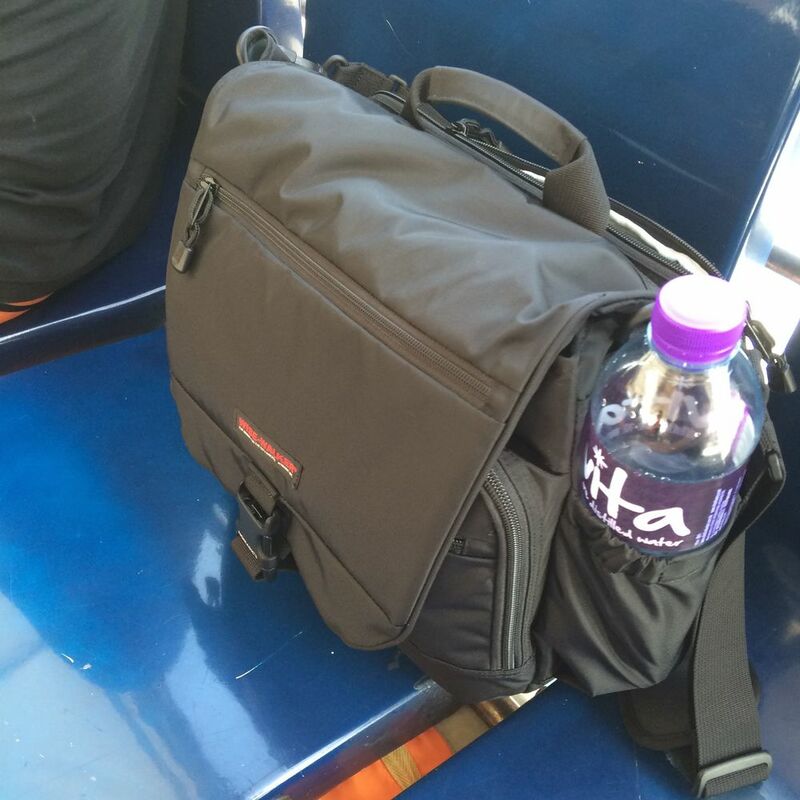 This I think is a good design, but there are two related problems: one is that sometimes I like to slide the bag from my back to my front, for example when I am on a crowded subway train. Because the pad location is fixed, when the pad is set right for the back, it will be wrong for the front. 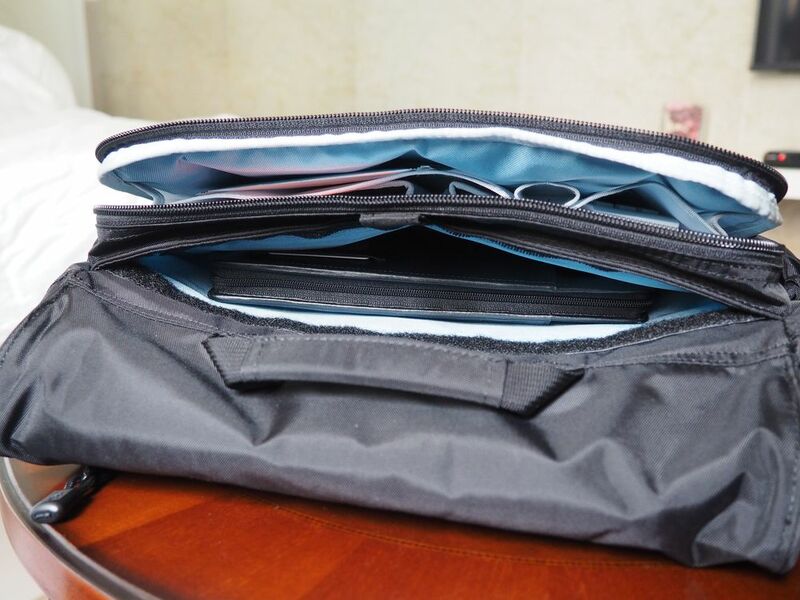 Most of the inside organizer pockets are made with a semi transparent mesh. So you can see what is in them. The ones that are not made with messed are padded. Packaging -- look at the little "tab" that is used to wrap the strap in the packaging. Nice touch. inside the front outside zipped pocket, there is two small shallow pockets that are good for subway pass cards. inside there are two mesh pockets across the very back (outer side), three slightly padded pockets and two pen slots on the other side, and two meshed pockets behind them. The back of the bag has the "airmesh" type materials. I can tell you it really makes a difference after testing it out in the hot humid (33C, 70% humidity) Hong Kong environment. and finally, there are two water bottle pockets on either side of the bag, and they are large enough for 500ml size bottles. This is the only medium size problem -- the bag has a flawed side wing design in the main compartment. In theory when the front flap is closed, the side wings will fold inwards to make sure rain will not get into the bag. But I find that most of the time the wings ended up folding outwards instead (see pictures). But seriously this is a very well thought out bag. I highly recommend it. However I seems to not be able to find it online in the US, nor in Shanghai. Nice flat "tie/wrap" for the shoulder strap. There are two pockets, one one each side. It has a elastic openning. It is not very deep but will hold a typical Asian 500ml water or drink bottle easily. See the small but effective handle, as well as two compartments/pockets in the back. The zip compartment is clearly visible, but behind that is a full wide velcro hidden compartment. Another top view showing the back of the bag. See the center tab which can be use to pull open the velcro for the security compartment. Also note that the tiny "wings" on the left side, which should be folder in to keep rain out when needed. 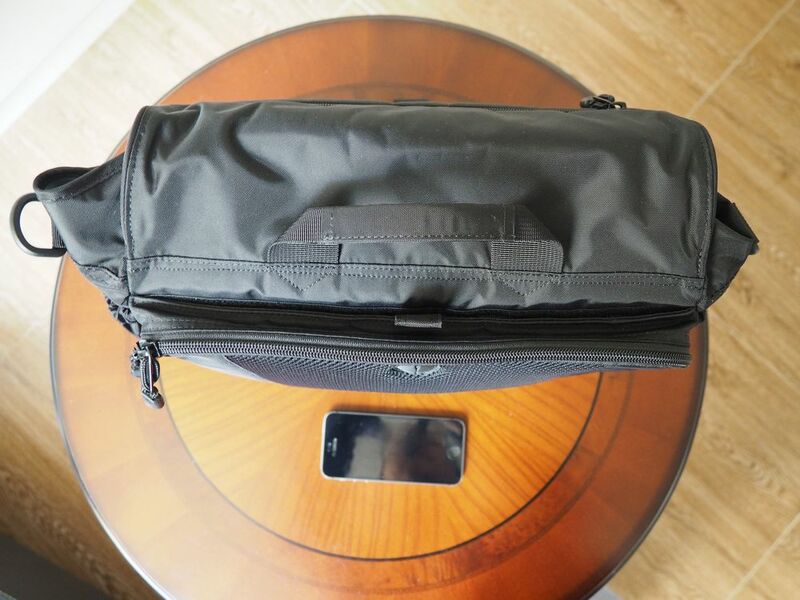 The front flap has a zipped compartment, suitable for flat items that you need to access quickly. There are two small pockets inside that is designed to hold a subway pass. This is the first of the two front pocket under the flap. It is silghtly shallow and thin, good for tickets I suppose. 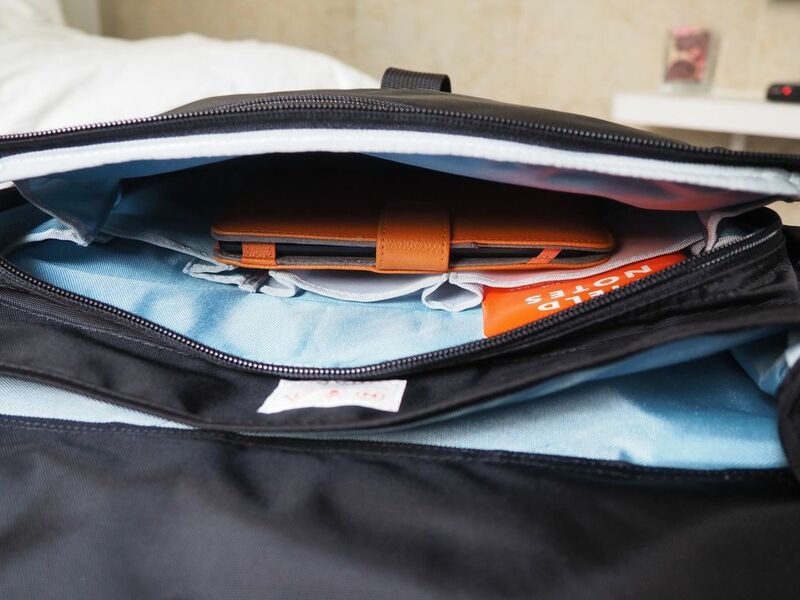 Under the flap, there are two compartments in the front of the main compartment. The first one is a small short full wide zipped pocket. The second one shown here, is a very large compartment with a lot of room, and three mesh organizer pockets on the back wall. Here you see I placed my iPhone and my fieldnotes in the pocket to show the pocket. Normally those two items go to the back compartment. Another view of the front main compartment with my Kindle inside. 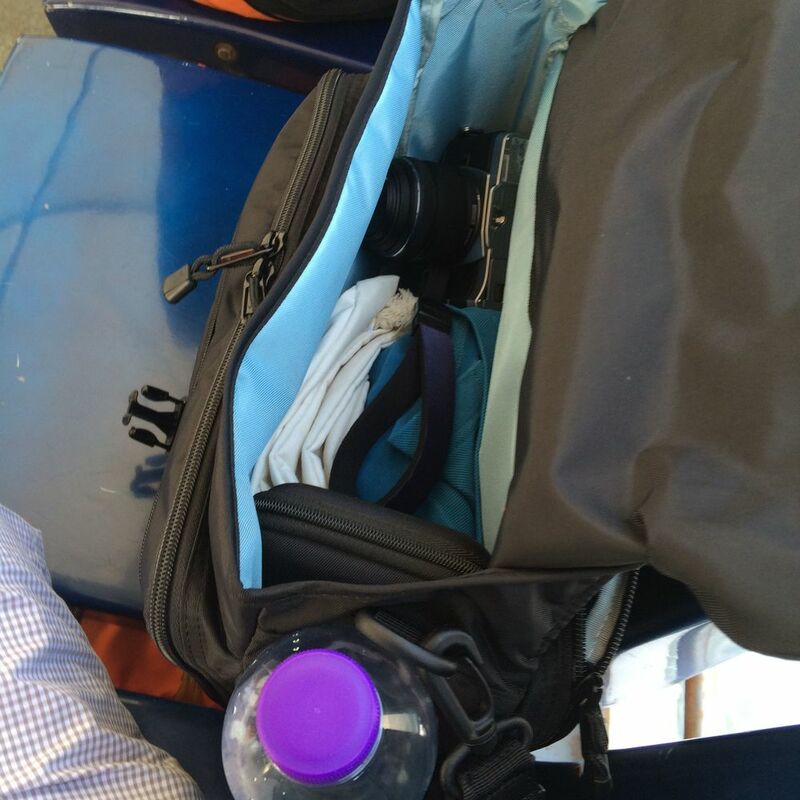 Another view/use of that front compartment -- this time, glasses case, notebook, and battery pack. Main compartment with my micro 4/3 camera, shirt, my phone battery pack etc. Still lots of room left. This is the larger back compartment, in the back most area of the bag. There are mesh pockets and slightly lined pockets for organizing things. From left to right: my Karas Kustoms pen, fieldnotes, my iPhone, my wallet. 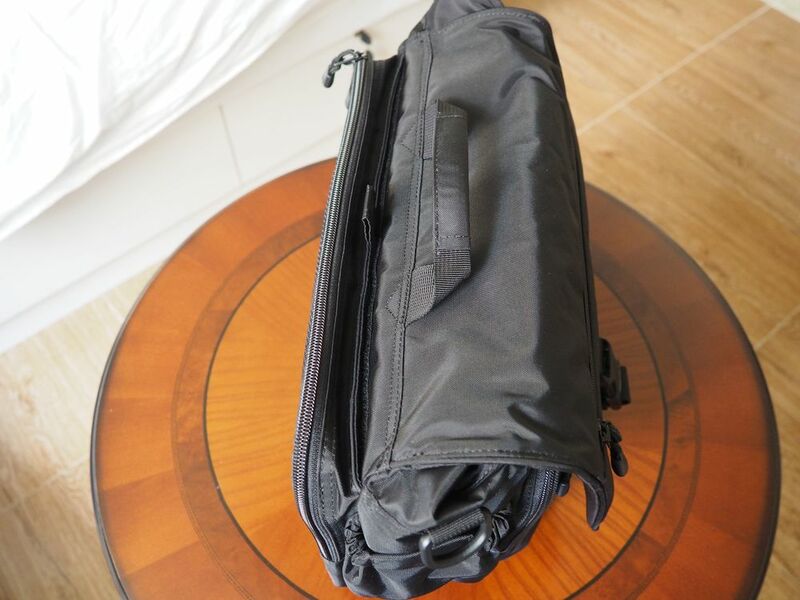 The back of the OS-01 bag has two large and very useful pockets. This is where I keep the important items. The back most pocket has organizer pockets on both sides. The second compartment is "hidden" because it is closed by a long strip of velcro. You can see my passport and my wallet in there. Another view of the back compartment. I put my levenger road scholar travel organizer in the secret compartment. In the field, with a bottle of water on the side pocket. Main compartment in action. My 13 inch Macbook Pro fits inside easily, with a rolled up polo shirt.